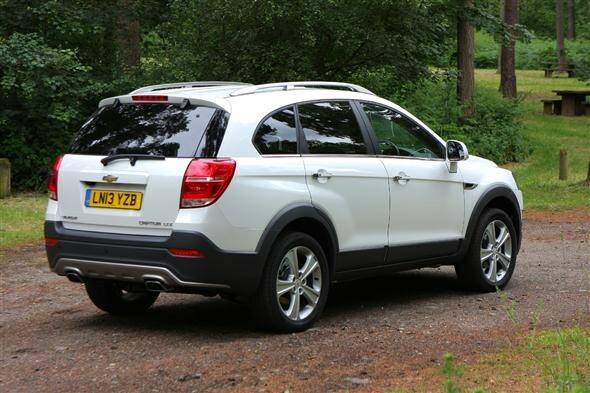 Should you buy a Hyundai Santa Fe or Chevrolet Captiva? With escalating fuel costs persuading many motorists to downsize, you’d be forgiven for assuming that the market for large, seven-seater 4x4s had dried up. If it has, nobody’s told Chevrolet or Hyundai. 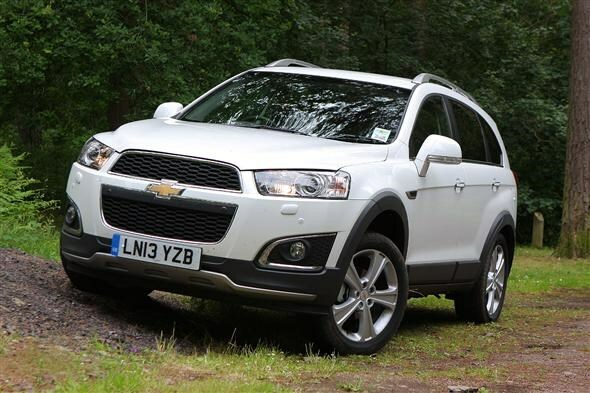 Hyundai Santa Fe vs Chevrolet Captiva - which is best? 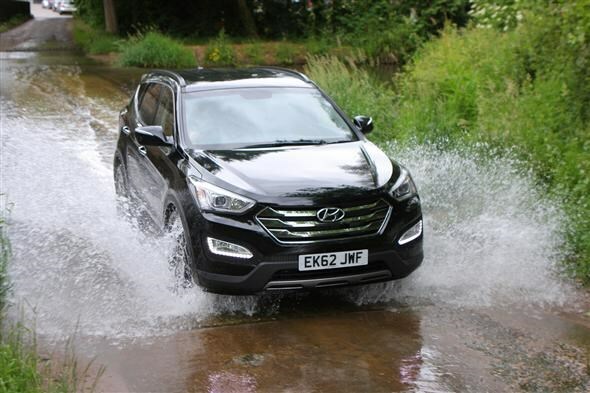 We pitted Hyundai’s third generation Santa Fe, still in the first flushes of youth having been on sale a year, against Chevrolet’s older Captiva, which has just been given its second styling refresh since it arrived back in 2007. Which is the better buy for larger families? Climb inside the Santa Fe and immediately you’re struck by how much newer it feels than the Captiva. Not only is the design of the dashboard more adventurous and ergonomically sound, the plastics used feel significantly more substantial and pleasant to touch. Both are generously equipped, the Chevrolet in flagship LTZ trim, the Hyundai in second from the top Premium specification. 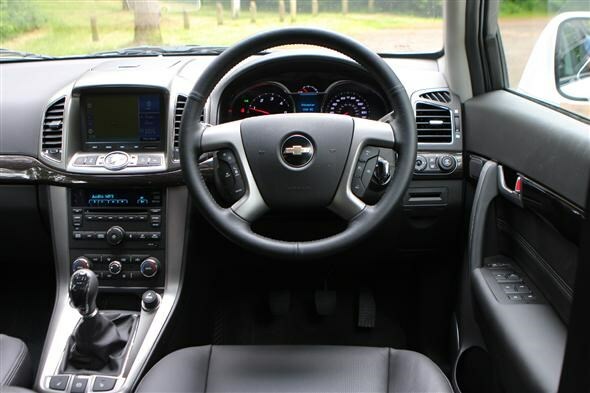 You’ll be treated to seven leather seats, dual zone climate control, Bluetooth enabled infotainment and sat nav system with colour touchscreen, parking sensors with reversing cameras and cruise control. While the Santa Fe boasts air conditioning vents for the third row, the Captiva responds with an electrically adjustable driver’s seat and keyless entry. 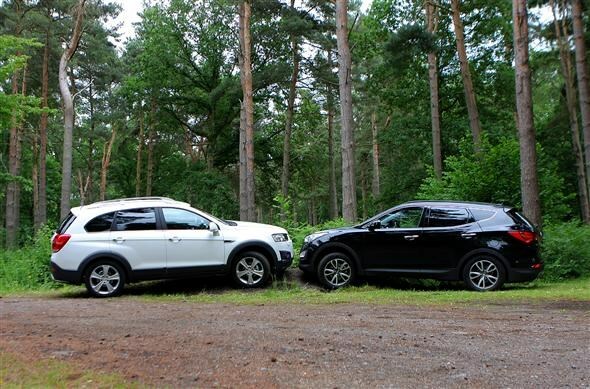 Hyundai Santa Fe vs Chevrolet Captiva - how practical are they? Practicality and flexibility are the key watchwords for these types of vehicles though and in common their middle row seats tip forwards to access a pair of third row chairs that are best reserved for children. Raising and lowering the rearmost seats is a painless experience in both, folding flat into the boot floor when not required. Cubby holes and storage areas are niched into the interiors, the Chevrolet playing a joker with a sliding cover in the centre console revealing a deep cavern to hide belongings from prying eyes. 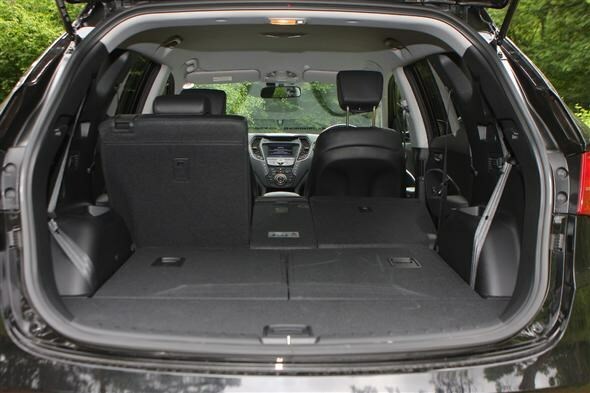 Hyundai seems to have gone to greater lengths to make the Santa Fe easier to live with than the Captiva though, with its luggage cover being simple to remove and stow in a well under the back of the boot floor. By comparison, the Chevrolet’s boot covering is more awkward to install and can’t be stored inside the car if the back row is in use. 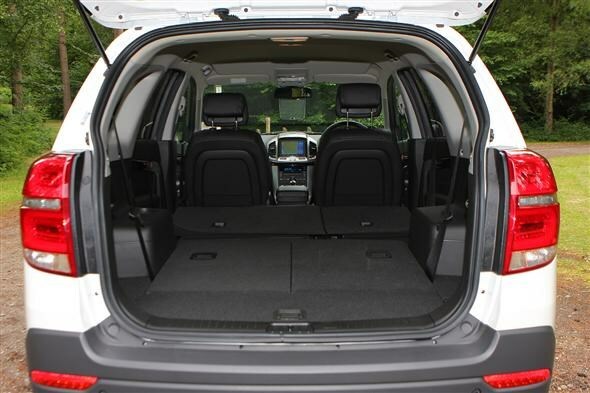 However, you can pop open the Captiva’s tailgate glass to access the boot, a convenient feature in tight multi-storey parking bays. Neither wins the loading lip challenge, both with a fairly high 77cm boot ledge and while the Santa Fe’s tailgate opening is a useful 20cm wider than the Capitva’s at 119cm, the Chevrolet's opening is 7cm taller at 81cm. 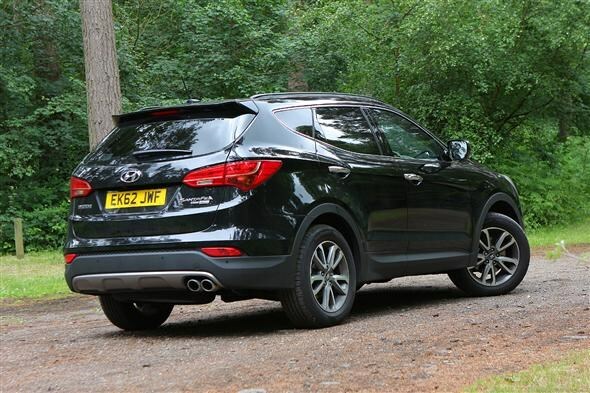 Transporting luggage around is also easier in the Santa Fe with a wider, longer load bay whether in two, five or seven seater modes but the Captiva scores a bonus point as its middle row does fold completely flat. Be very aware that with all seven seats in use, boot space for both is pitifully small. The more vertical tailgate angle of the Chevrolet allows it to carry bulkier loads even though its ultimate 1577 litres of cargo space is less commodious than the Hyundai’s 1615 litres. If travelling seven up isn’t going to happen too often, then you’ll appreciate the Hyundai’s more spacious first two rows. It feels noticeably wider and the tape measure confirms it offers 7cm more elbow room in the front. But the third row is the Santa Fe’s downfall, with the sloping tailgate seriously impinging on head room, the Captiva being 12cm more generous, as well as providing 3cm less legroom. 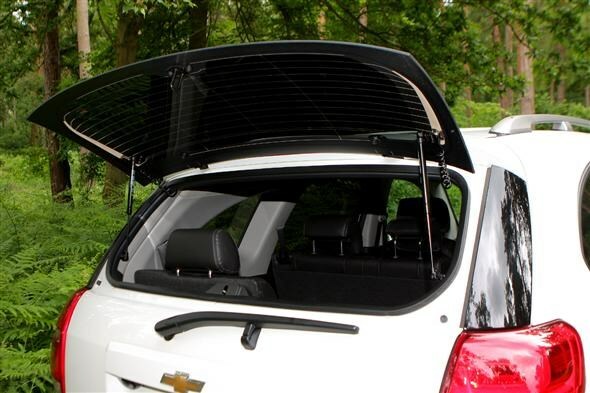 Depending on how your children deal with travel sickness, third row inhabitants are also likely to appreciate the better view outside provided by the Chevrolet’s larger side windows at the back. Both cars look imposing on the road but go about it very differently. Whereas the Hyundai is physically wide and garnished with lots of chrome-look trim, the Chevrolet’s nose is dominated by a large, upright black mesh grille. You can’t avoid noticing them looming large in your rear view mirrors. Fitted with 2.2-litre turbo diesel engines, both offer similar amounts of performance, although at 181bhp and 295Nm of torque the Chevrolet falls short of the Hyundai’s 194bhp and 311Nm. 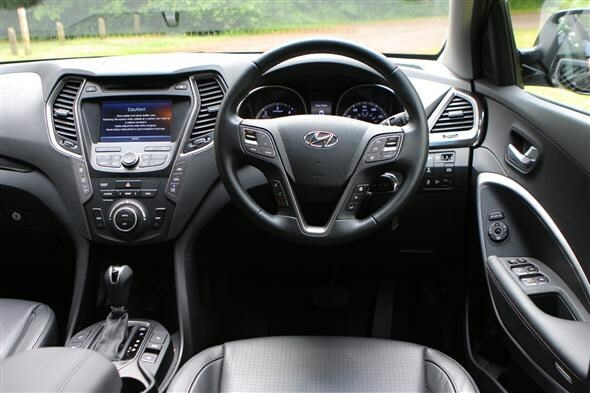 Although our test Santa Fe was equipped with an automatic gearbox, the cheaper manual option allows for speedier overtaking and better economy. 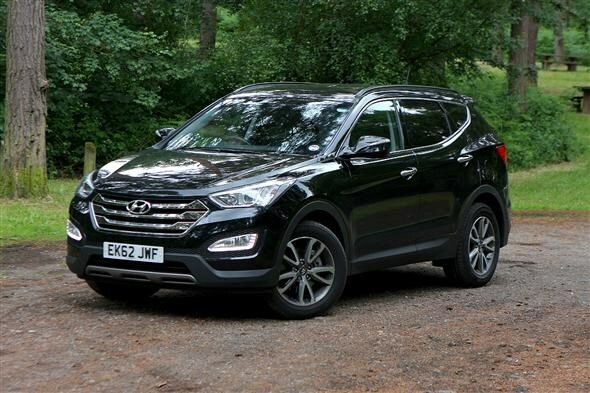 However, both fell short of their claimed efficiency figures, the Captiva averaging 34.2mpg on test (44.1mpg claimed), the automatic Santa Fe 35.3mpg against a suggested 41.5mpg. If the getting close to the manual Santa Fe’s 46.3mpg is possible, you’ll be visiting filling stations less often. Neither sets benchmarks for ride and handling but if you’re moving up from a more conventional car, the Hyundai is the easier to become accustomed to, feeling like a smooth riding, tall estate car than the more unsettled and wallowy Chevrolet. Cornering is an uncommunicative experience in both cars with high levels of grip provided by their four wheel drive systems and wide tyres but at the steering wheel there’s little evidence of what’s going on out front with light and vague sensations. Driving through a babbling ford and tackling some gravelly undulations in a forest was as serious as the off-roading went on the test, which was still more adventurous than most Captivas and Santa Fes will experience. Neither really possesses go-anywhere ability that would make them ideal companions for an Amazonian expedition, but the Hyundai’s significant on-road bias made it appreciably less wieldy when road surfaces become looser and angles steeper. With a greater amount of suspension travel the Captivas tackled deeper ruts and hillocks much quicker than the Santa Fe could manage. At £29,995 the Chevrolet is less expensive to buy than the £30,670 Hyundai when specified with the manual gearbox. Consider that the Chevrolet’s equipment levels are slightly higher too and it seems like a better value package. Neither is especially clean from an emissions perspective but at 159g/km of CO2, the Hyundai’s band G road tax grouping is less expensive than the Chevrolet’s band H, the Captiva registering 170g/km. Consider too the Chevrolet’s inferior fuel efficiency and that value-for-money forecourt price looks less of a bargain. 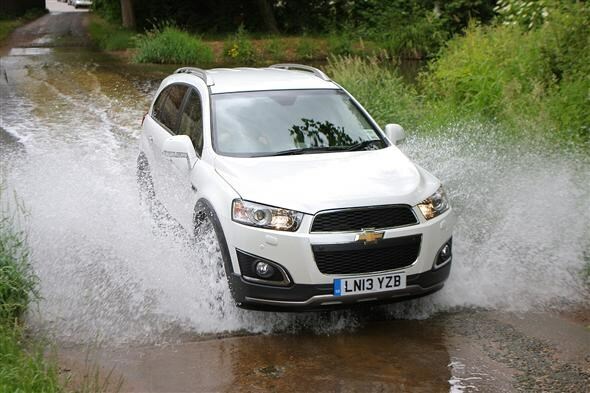 If you regularly drive a car with six passengers and need something that’s capable of tackling tougher terrain, then the Captiva’s more spacious third row seating and greater off-roading abilities might tip the balance in the Chevrolet’s favour. But for the vast majority of buyers in this segment, the Hyundai is easier to live with, is less expensive to run and overall it has a more pleasant environment in which to travel. If the Captiva was significantly cheaper it might make the decision less clear cut, but while it isn’t, the Santa Fe is our clear winner.